Earlier this week, I released a relatively significant update to Comment Images that introduced the ability to globally enable or disable comments on posts across the entire site. Seriously. What if I told you? Since that release, I’ve received a couple of comments and several emails all of which were asking for a few minor improvements to the functionality so, late last night, I rolled out another relatively significant update to the plugin. 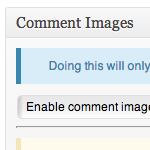 Perhaps the most significant update to the plugin is that you can now add comment images to pages as well as on posts. Comment Images are globally enabled by default (rather than disabled). This came as some people were upset that the latest version required that they turn it on (rather than turn it off) upon plugin activation. As mentioned, comment images can not be added to both posts and pages. I’ve been really happy with the way that this plugin has been received; however, I do think that at some point – likely whenever I begin working on 2.0 – I will have to fork the codebase, as there is a bit of code specifically in the plugin to handle legacy functionality that I believe is ultimately more of a pain to maintain than otherwise. Plus, starting from a leaner code base will allow for a newer feature set, more forwards compatibility with WordPress 3.6 and forwards (as of now, the plugin is compatible back to 3.4.1! 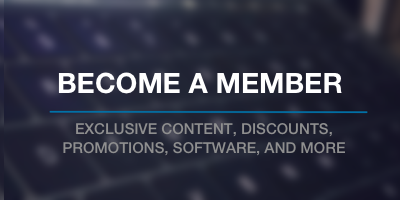 ), and generally nicer functionality. That said, I don’t know exactly when development on this will start as the 1.X version is still plugging along, but I’ve already begun to brainstorm the next version. Anyway, so there’s that – Comment Images 1.12.0 released and ready. Have at it. This is the first reported incident of this issue, and there’s nothing in the plugin that should be writing out anything but the image. Are you seeing it with every single comment image, or just a few? And do you have any other comment-based plugins running? Not in every single comment, I haven’t any comment plugin turned on, I’ve just observed it adds to a comment following in html span style=”img_hide” >number < /span . It may be something within WordPress, not the plugin itself. This sounds like something may be interfering from another plugin, a style, or some theme feature. I’d recommend trying to disable some of the other plugins, then re-enabling them one-by-one to see if one of them ends up triggering the odd behavior. Is there a way to delete an image out of the comment? I can’t find a way without deleting the comment. At the current time, there is not without actually knowing how to edit the database. Is this something you may be working on for an update? Not likely as I prefer to keep the images stored in the same directory where WordPress stores its images. hello,i have a question , that is how to change the image upload folders? 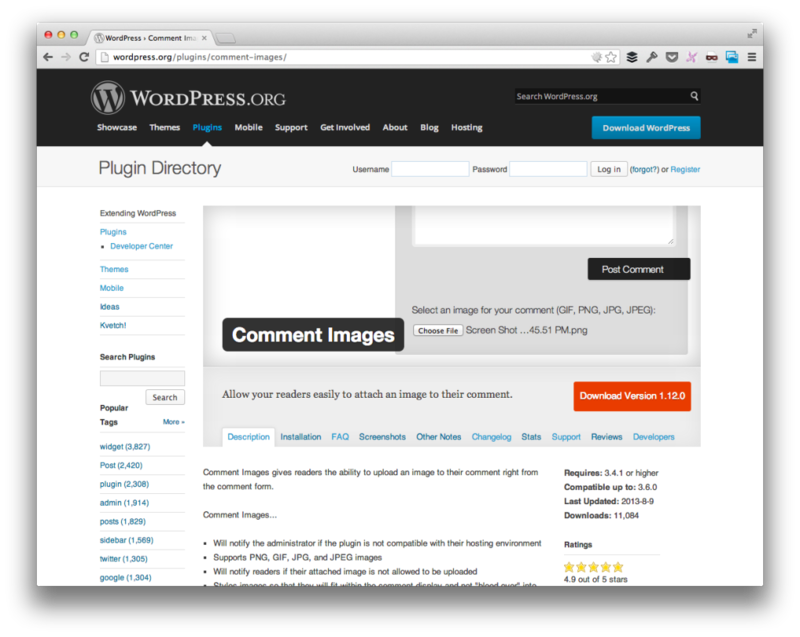 Without reworking the code, you can’t – it uses the default WordPress media uploads folder. Hi, Tom! Please, help me. 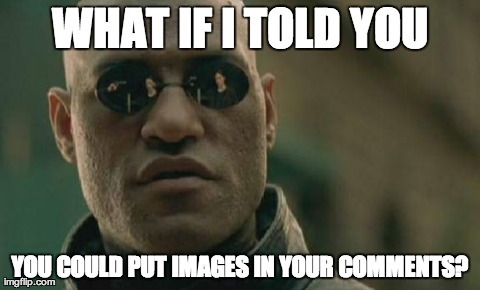 I installed your plugin “Images in comments” for WordPress. All is working well. It’s simple and useful plugin. One thing i’m asking you to help me with the size of image that is uploading by the plugin. The original image can be very heavy (high resolution). I want to make a correction that resize foto to lower resolution, 1024×768 for example. Is it possible? Thank you so much! Please shoot me an email directory and we’ll take care of it. If you already have, give me some time to work through my inbox and I’ll be with you ASAP. Hi Tom! Great work. You are a magician. Is there anyway that I can limit the picture dimensions being posted in “Comment Images”? In some testing, the pictures being added to a post can be rather large file size wise and/or the dimensions eat up the page. I’m not quite to the “rookie” level so any help you can provide would be amazing. Is there anyway that I can limit the picture dimensions being posted in “Comment Images”? In some testing, the pictures being added to a post can be rather large file size wise and/or the dimensions eat up the page. Given the current version, there’s no easy way to do this. The best way is to use CSS either Jetpack’s custom CSS module, your own CSS module, or creating a child theme. Image sizes can be changes by using the .comment-images selector. Usually, setting their max-width equal to 100% will do the trick. It looks like this is the best place to seek support for the comment images plugin? I’m hoping that you can help me with a random glitch I’m experiencing. We’ve used your plugin quite successfully for a few years now. At some point in the last 3-6 months, it stopped appearing below our comment box! I’m honestly not quite sure when or why it stopped appearing. I just suddenly noticed it one day! We had also added some text to the our Comments.php file to indicate basic instructions for how to use the comment image function for our visitors. Our site is hosted on WP Engine so I contacted their support and asked them if they had any way to determine when and why the comment image function stopped appearing. Their support team mentioned to me that it may be a conflict with the fact that we have CDN enabled for our website. They suggested I contact you and ask if your plugin supports CDN or if there is some way to enable that functionality. But I’m also wondering if this makes sense to you, or if you have an alternative idea as to what might have caused the upload button and associated direction text to suddenly stop appearing? The folks over at WP Engine discovered that it had nothing to do with the CDN at all, as I suspected. Somehow the Comment Image functionality was disabled in all the posts, per the right-hand sidebar options in the Post frame. I’m not sure how that happened, but it all seems to be working fine now. Ah, thanks for following up, Tristan! The plugins I work on are for free, so I don’t really set a schedule for when I have time to work on them. Right now, I usually work on them as time allows and I don’t have a lot of free time :).